Let’s Get Green in Western Springs, IL! Springtime is finally here. Time to fling open the windows and let the fresh air inside. And time to roll up our sleeves for spring cleaning. But what should you do with all the “stuff”? Well, if you live in or are thinking of buying in Western Springs, IL, you are in luck. The Village of Western Springs is a proactive leader in conscientious cleanup and waste management. 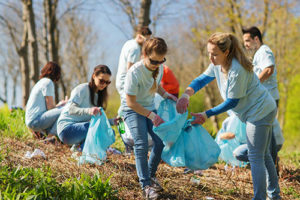 The village started its spring cleaning a few weeks ago with NEAT Cleanup Day, a 33-year old community tradition in mid-April when work glove-clad volunteers converge on the streets of Western Springs, brooms and rakes in hand, to clean up the parks and other public areas. Need a deadline for spring cleaning? Republic Services, the waste collection provider for Western Springs, will accept most household items curbside on May 12th from 6:00 a.m to noon. Got an old mattress, dresser, refrigerator, or sofa? Gone. They won’t, however, collect hazardous materials like chemicals, supplies left over from your kitchen remodel or rebuilt car, explosives, or electronics. Basically, if Republic Services wouldn’t normally pick up these items, they won’t do it on Household Cleanup Day, either. Want to reuse or repurpose something? This year on April 24th and 25th, you can pick up items you might need (new summer wardrobe, anyone?) at the annual Spring Rummage Sale. Sponsored by the First Congregational Church of Western Springs, don’t miss the 50% off sale on day two. And be sure to make a note to donate next year as part of your spring cleaning. For a list of items they accept, see here. Wondering what to do with other waste items? 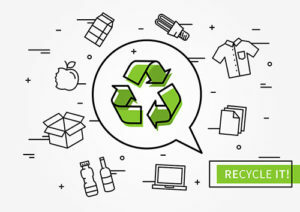 The Village of Western Springs, IL boasts a “flexible” waste collection program that “encourages recycling.” From household items to yard waste and recycling, they’ve got it covered curbside and at your back door. Can’t reduce or reuse? Recycle! Drink containers, glass and plastic bottles, jars, and jugs must be rinsed out. And plastic containers must be marked with the recycle symbol and the numbers 1 through 5 or the number 7. As you clean up your yard and plant your spring bulbs, be sure to buy your prepaid waste stickers and biodegradable bags. You can find these not only at Village Hall, but also at local grocery markets and hardware stores. Western Springs contracts Republic Services to pick up yard waste curbside from April to November. Just be sure your bags are no bigger than 33 gallons or 60 pounds. What can we do with all the items on the “will not accept” list? If you have any of the hazardous materials, electronics, or other items that Republic Services will not accept, one of the best places to look for proper disposal is Earth911. You can run a search based on your zip code, and find the closest location and fees to you. Electronics are recycled through a state-wide program. If you live in Cook County, you can use the Village of Burr Ridge drop off site between 7:00 a.m. and 3:00 p.m, Monday through Friday. There is a fee; however, you can feel good about two things–your electronics will not be sitting in a landfill for all eternity, and the proceeds benefit the developmentally disabled. For more information and a complete list of items they will accept, please see the program’s informational brochure. Western Springs, does, however, have a local Styrofoam recycling program. The first Saturday of the month, you can bring your Styrofoam products to the parking lot next to the Recreation Center from 9:00 a.m. to noon. Just don’t bring any packing peanuts. They can’t be recycled. However, nearby packing and shipping stores will be glad to have them. You can find more information, including the person to contact here. Western Springs, IL–sound like a great place to live? If Western Springs sounds like a great place to live, contact the local expert, Realtor Nancy Miller with Coldwell Banker. Nancy has been serving home buyers and sellers in and around Western Springs for over 25 years. Want to learn more about how Nancy Miller can help you find just the right home in just the right community? Let Miller Move You!